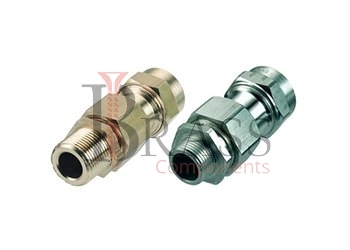 Flameproof Cable Glands are manufactured from Brass, Nickle Plated Brass, Stainless Steel, Aluminium, plastic, polyamide or any material composition as per custom specification. The manufactured range of Flameproof Cable Glands are compiled to meet the BS: EN 50262:1999 Standards. 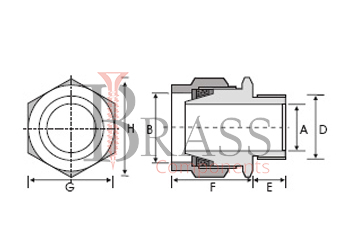 They are available in different types of PG, Metric or NPT Threads. The standard range of Flameproof Cable Glands are constructed in such a way that it will maintain the flameproof integrity of a flameproof enclosure to which it is fitted. Flameproof Cable Glands provide earth continuity and cable support to entering the equipment. Flameproof Cable Glands widely used in various hazardous areas. Depending on variety of Applications, Flameproof Cable Glands are available with different types of cable gland accessories including Lock Nut, Serrated Washer, Earth tag, Reducer, Adapter, Neoprene washer and more. Explosion Protected as well as according to Increased Safety standard. Provide extra support to the heavy armoured cables entering or existing the panel. CE, UL and cUL Approved Flameproof Cable Glands. Suitable for most climatic conditions including weatherproof, waterproof and deluge prof. Provide high performance in high temperature and deluge proof conditions. Ensure containment of an internal explosion in flameproof equipment. Maintain Integrity of restricted breathing equipment. Optimum Performance, Superior Finish and Strength. Generally used in flammable gas / vapours area as well as in normal climatic conditions. Widely used in hazardous climatic condition. Generally used for armoured cables & outdoor use in plant installation and other industrial areas. We manufacture Flameproof Cable Glands as per Custom Specification and export in Finland, Jersey, Spain, Switzerland, Ukraine, Austria and other European Countries. For more Information, Please Contact Us or Inquiry Now.